Washington, D.C., December 5, 2017 – Financial Services Volunteer Corps (FSVC) volunteer expert Michael Messier today received the 2017 Volunteers for Economic Growth Alliance (VEGA) Volunteer of the Year Award. 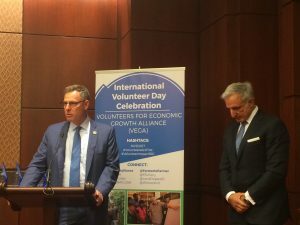 The award was presented to Mr. Messier by his Congressman, Rep. Scott Peters (D-CA), at an event on Capitol Hill celebrating International Volunteer Day. Mr. Messier also received a U.S. Senate Certificate of Recognition from Sen. Kamala D. Harris (D-CA). Mr. Messier served as a volunteer expert on four FSVC projects in 2017 on anti-money laundering and combating the financing of terrorism (AML/CFT), traveling to Uganda, the United Arab Emirates and twice to Jordan. Through his efforts, Mr. Messier has helped scores of motivated individuals across Africa and the Middle East to improve their legal and regulatory frameworks to combat criminal financial activity. A native of Cranston, Rhode Island, Mr. Messier has over fifteen years’ experience as U.S. Drug Enforcement Administration Special Agent, including six years working in Mexico City coordinating significant drug and money laundering investigations and enforcement operations with the Government of Mexico. He also spent five years at Bank of America in Mexico City as a Managing Director, where he developed and led the Latin American region under Global Financial Crimes & Compliance. Mr. Messier currently resides in San Diego, California. The International Volunteer Day event on Capitol Hill convened a broad spectrum of skilled volunteers, bipartisan congressional champions, leadership from the U.S. Agency for International Development (USAID), volunteer-sending organizations and experts from the private sector to celebrate the contributions of volunteers to effective U.S. global development. Participants also discussed a new initiative to leverage pro-bono private sector expertise to reduce poverty and promote prosperity worldwide. “Building bridges, and not walls, through volunteerism allows well-meaning, talented people to unite to overcome complex, global challenges. I am grateful to be able to play a role in these efforts through my work with FSVC,” Mr. Messier concluded. *International Volunteer Day is an international observance designated by the United Nations since 1985.